At carafem, there is one thing that is more important to us than anything else: putting our clients first. 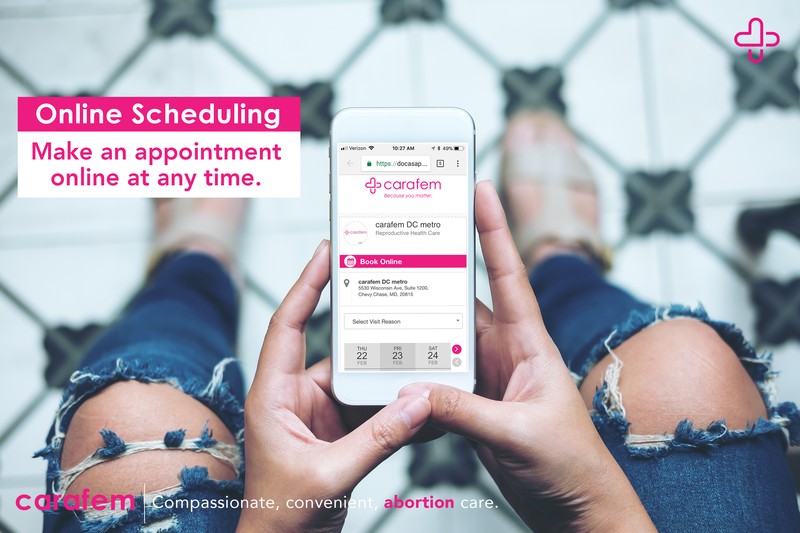 Every member of the carafem team is single-minded in our mission to make sure our clients have the best experience they can when they come to us for care, whether that’s an abortion, birth control, or being tested for STIs. As part of this client-centric approach, we are proud to offer online appointment-booking. We usually have appointments available the next day, and we offer appointment times in the evenings and on weekends. Why do we provide online appointment-booking for abortions, birth control, and STI testing? It’s always nice when you can make an appointment online. If you do prefer to make a call, our people will always be nice and supportive! But there’s something so convenient about making an appointment on your phone, on your own timeline, wherever you feel comfortable. You can even slip away to make an appointment, and that one nosey coworker will never know (sorry, Barb). And just know that if you have questions about anything — from what to expect, to directions, to insurance stuff, you can give us a call too! When do we have abortion appointments available? We have lots of times available! Most of our clients are able to make an appointment the very next day. We have appointments available in the evenings, and on the weekends – we know our clients lead busy lives. Because not everyone has the same schedule. And we know from talking to our clients that once they’ve decided to make an appointment with us for an abortion or other healthcare needs, they’d like the flexibility to make the appointment at a time that works for them. Find the carafem nearest you and click on the pink “Book Now” button.This will launch the online scheduling app. Find the DC carafem health center here. Find the Atlanta carafem health center here. If you like to roll old-school, or want to discuss any questions you have with a real human being(! ), you can give us a call at 855 SAY-CARA. If you have any problems, don’t hesitate to call us! We’re here to help!